I wasn’t aware of the sad history of this town when I visited, but my history-buff friend told me later that during World War II, Praha had the distinction of being the U.S. town with the largest ratio of war deaths to residents. The largest number of these deaths occurred in 1944. This piece says it best – In the space of 12 months and nine days, Praha gave up most of its youth — and nearly all of its future — to confront unimaginable forms of evil on faraway continents. 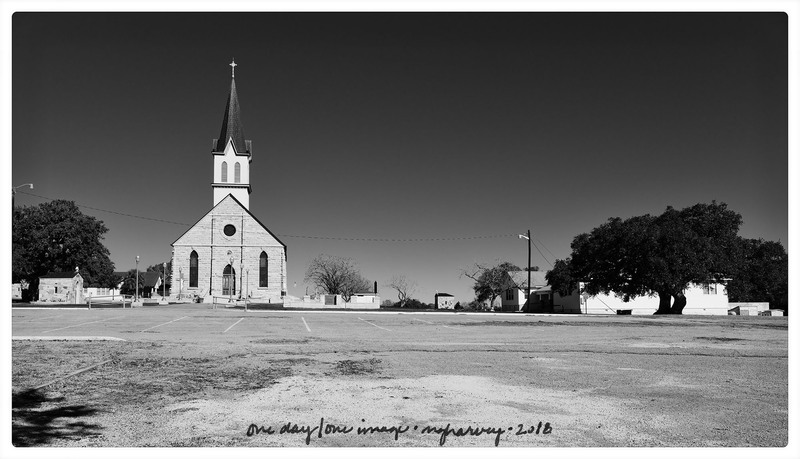 Posted on February 1, 2018, in Photography and tagged 365 photo project, black and white photography, cemetery, church, learning to see, melinda green harvey, monochrome, one day one image, painted churches, photo a day, photography, postaday, Praha, Praha Texas, St. Mary's Church of the Assumption, texas, thoughtful seeing, travel photography, war dead, war memorial. Bookmark the permalink. 2 Comments. As has been said before, “Freedom isn’t Free”. Appreciate you sharing what you learned of the history. How interesting that your choice of image reflects that history. I hope to get back to this little town soon, now that I know its history. I want to see the cemetery and the small chapels on the church grounds that were built to honor the war dead.